It has been suggested by many people that I should start a blog so they can read about my sailing adventures.So grab a rum runner, put on a life jacket, and click on one of the pictures above to read short stories from my trips, look at some photos, and even watch some short video clips. We splashed Saga about a week ago. First time she’s been in the water in years. His darling daughter, sister and brother were onboard for the launch and inaugural sail to Oriental.This blog entry is going to be selfishly about me. I had a love/hate relationship with Keith. I loved how stupidly smart he was. I loved his wicked humor. I HATED what he routinely put his family through with his idiocy. I miss him I shouldn’t have to miss him. He was a force to be reckoned with. I have never met anyone who blazed a path thru life the way he did. I just miss him. 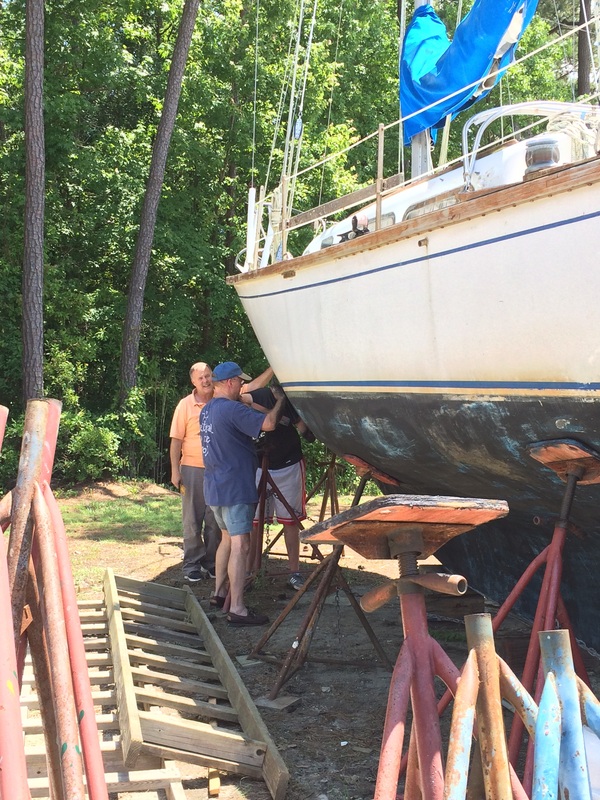 Fair winds and following seas…..
S/V Saga is in the water! 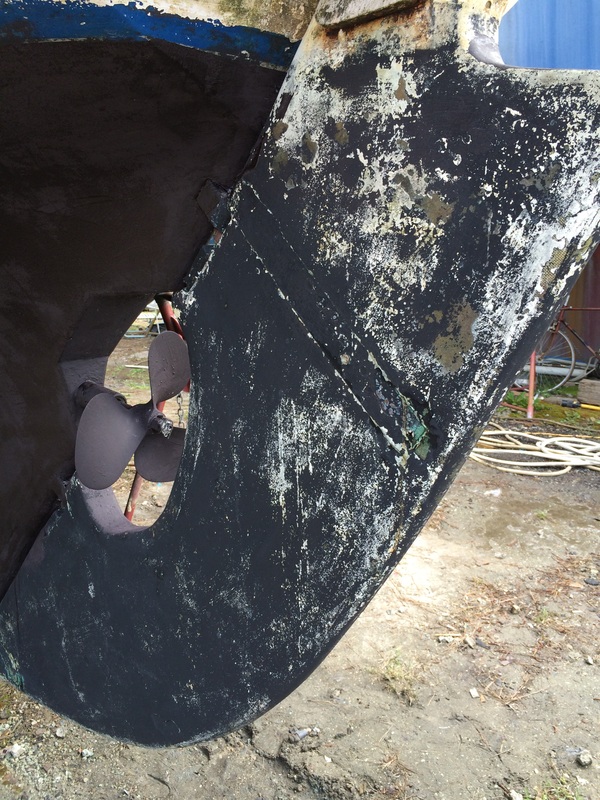 Kevin is taking her to Norfolk and hope to restore her in his spare time. 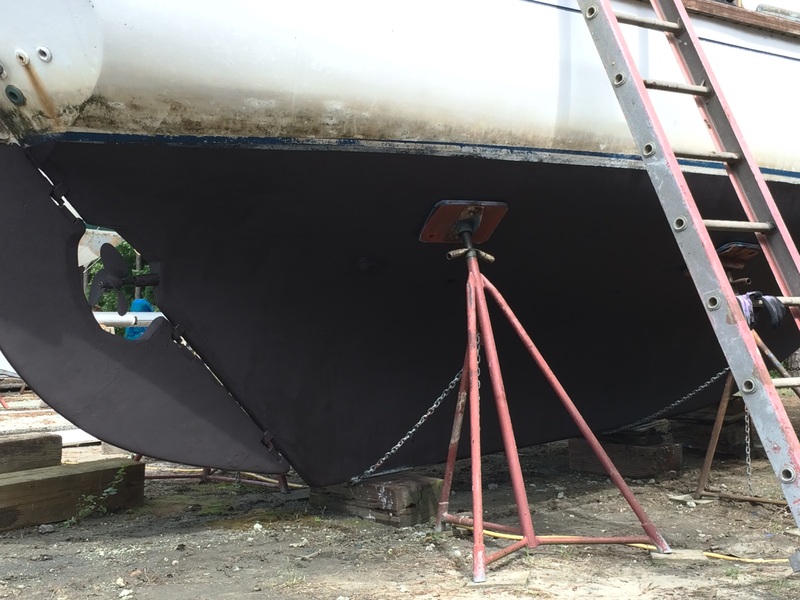 Jib is up; motor is off. 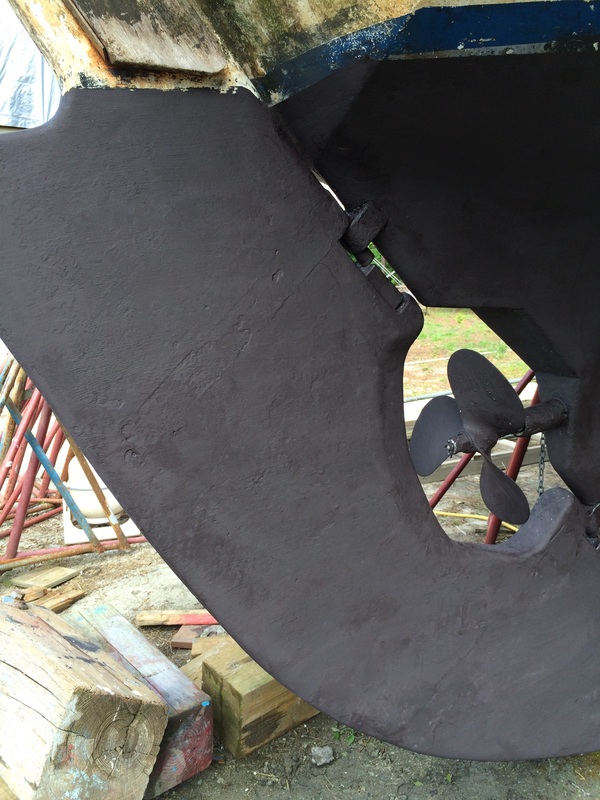 Jib sail. Can’t get a full photo from on the boat. 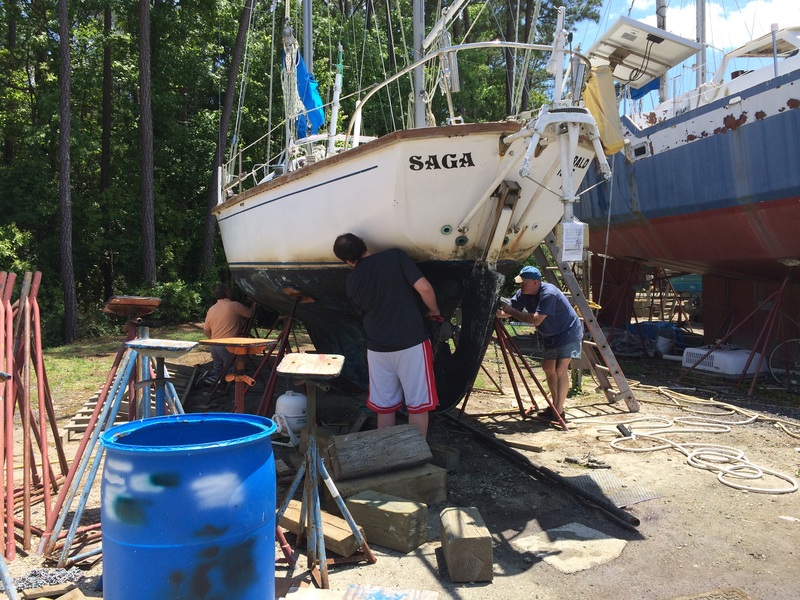 S/V SAGA got a little TLC today. 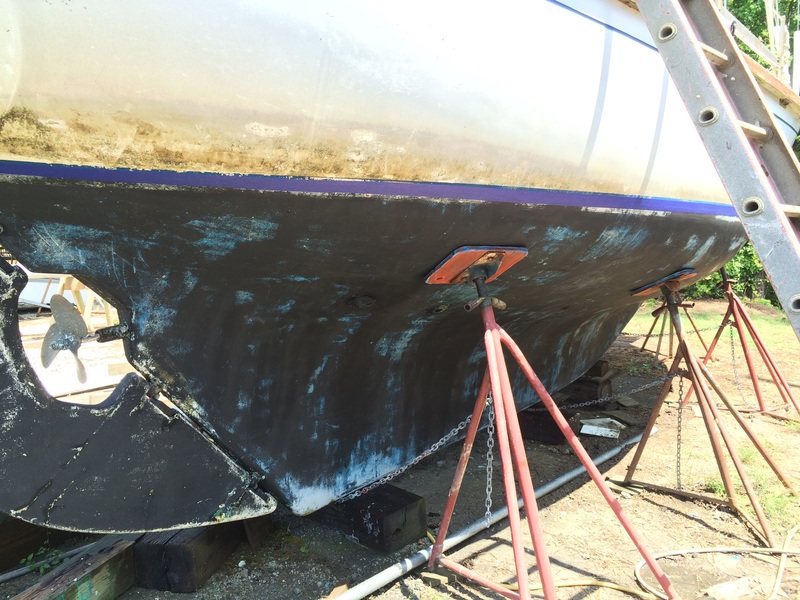 Her bottom received a fresh coat of paint. Will she sail the high seas soon??? We’ll see! 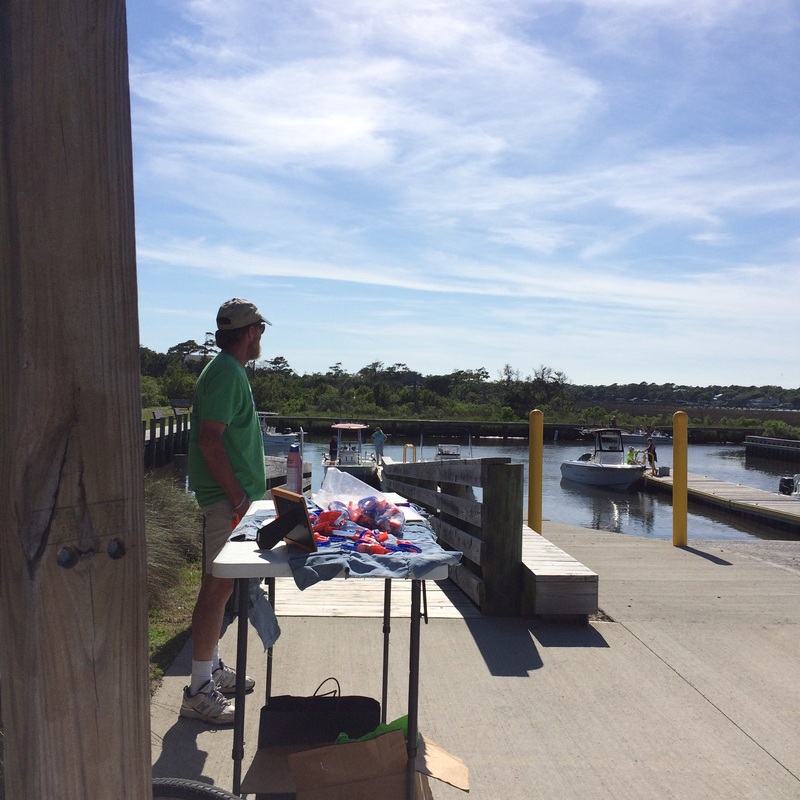 Today Kenny, Amy, Kim, David and I handed out about 450 survival whistles at the Beaufort public docks and the Emerald Isle public boat ramp. 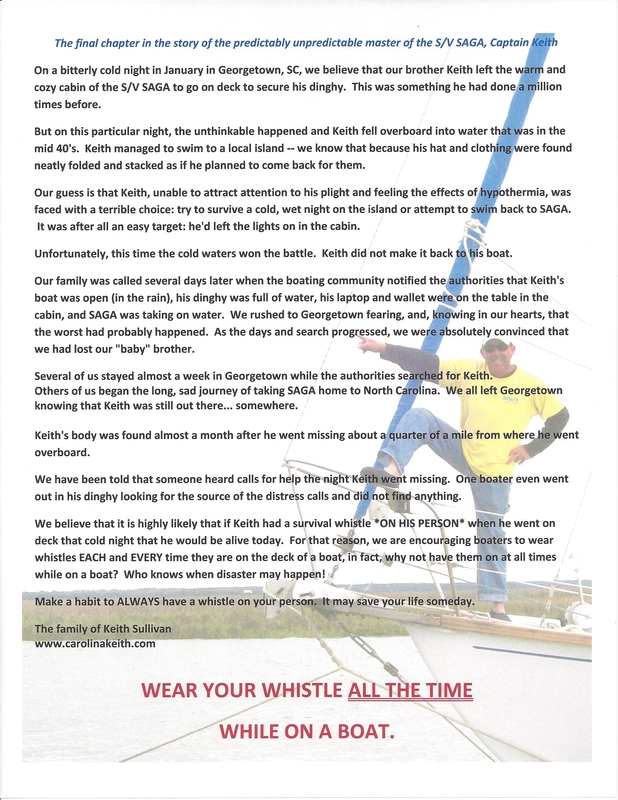 Whistles are purchased by our family and with donations made by friends, relatives, and those we meet telling Keith’s story. Many people asked today how they can make a contribution to future events. Checks may be made payable to Kelly Wyatt and mailed to P.O. 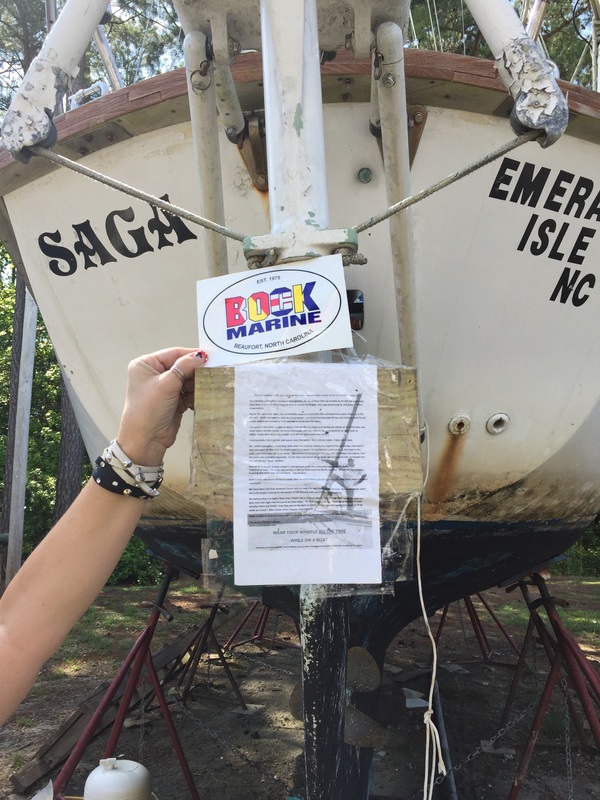 Box 4481, Emerald Isle NC, 28594. 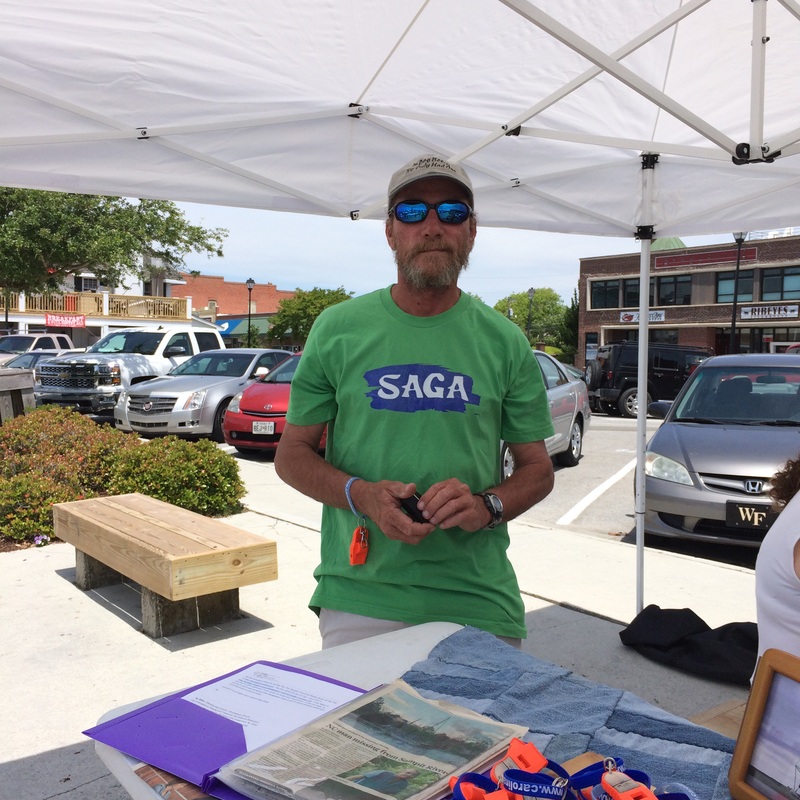 We posted Keith’s story near Saga. 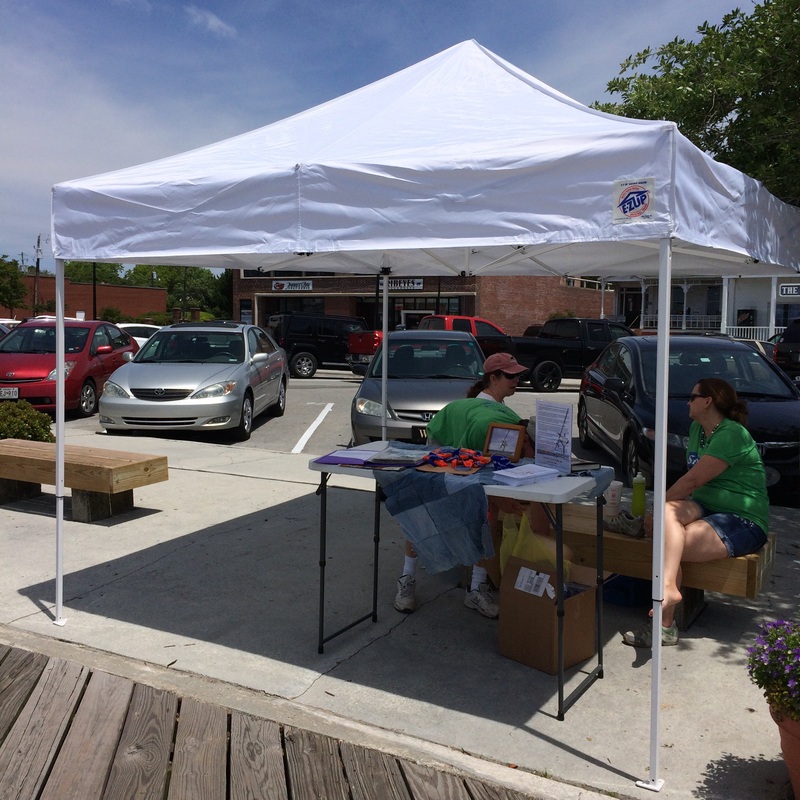 Saturday launches the 2015 National Sate Boating Week. Remember…. practice safe boating: Always wear a whistle. By May 1 I hope to announce the locations of our next whistle project. We are making plans for the 2015 Whistle Project. 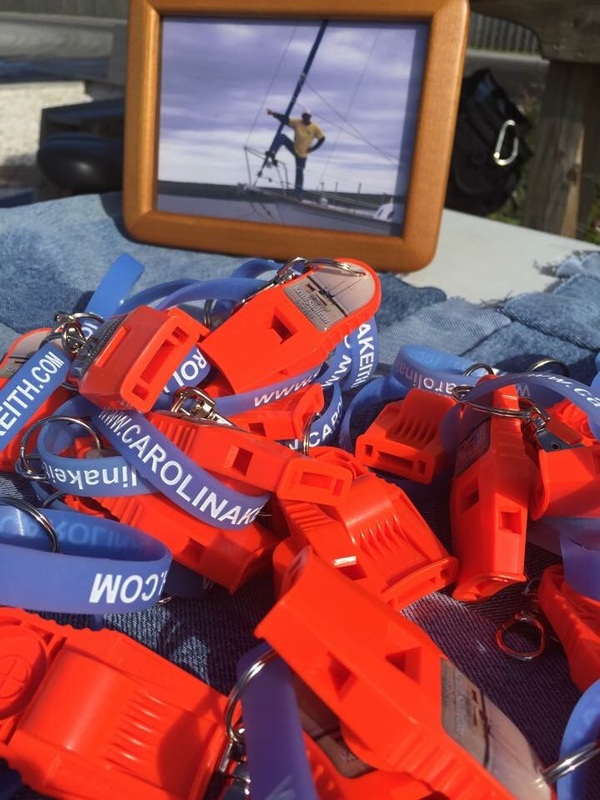 Pending approval by the governing entities, we plan to distribute whistles to boaters at the waterfront of Beaufort, NC Saturday, May 16, from 10AM-2PM, and then at the public boat ramp at Emerald Isle from 4PM-7PM on the same day. Please, everyone, wear your whistles. 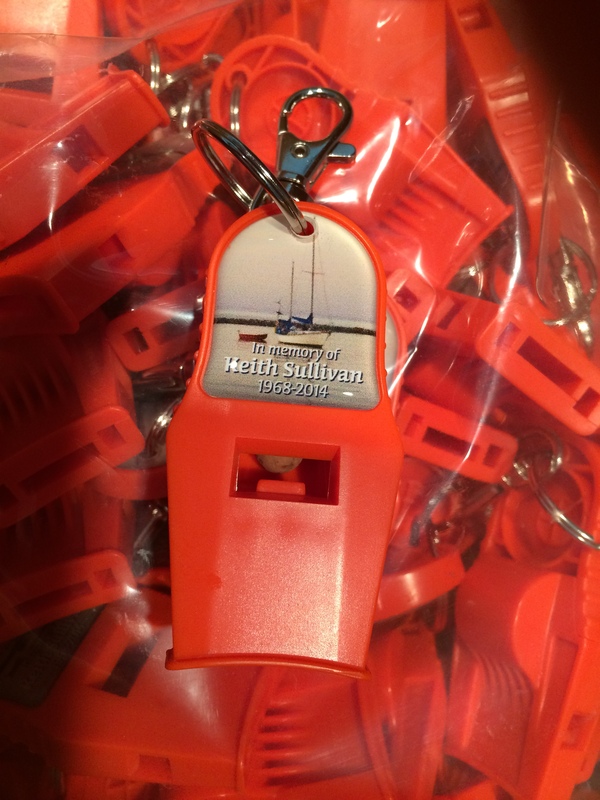 Our family will be discussing the 2015 Whistle Project in the next month or so and we’ll let you know where you can stop by and get one. Monday, January 12 will be one year. 365 days. And each one we’ve missed you. Here are some random photos that we used at your memorial service. No captions, and the order may be off… But it shows a little of who you were. In May of 2013 our mother passed away. We were unable to have services immediately, so we waited a few months so that we could all be together. In August, 2013, all “6K’s” (plus families) gathered at the beach the week before Mom’s services. One “K” was late in arriving, but, thankfully, he was able to rearrange his (unexpected) work schedule and make it. We had a great time all together for the first time since, we think, roughly 1998. We know that Mom and Dad were with us in spirit and full of joy that we took the time and made the effort to all get together. Many years ago Mom confided in me that one of their (Mom’s and Dad’s) biggest fears was that we would all drift apart and never all get together after they were gone. I hope we remember that and that we continue to get together as often as we can — which is not easy since we live on two sides of the Earth! The week after our beach trip we had Mom’s service. Afterwards we had lunch with family and friends, then we went and had a family photo shoot. Kim has doctored one photo that I present as the Rogue Wave Christmas greeting. In the photo you will see the “6K’s” (in order: Kenny, Kerry, Kelly, Kim, Kevin, and Keith), along with six yellow roses. Our Mom and five of the 6K’s were born in Texas, and Dad frequently gave Mom six “Yellow Roses of Texas”, so we had to have them at Mom’s service. What a blessing that we were all able to get together and that we had these photos made. Little did we know that “K5” would be gone just a few months later. In closing, have a very Merry Christmas. Hug your spouse and your children, and all of your other family members. Reach out to family you may not have seen in a long time. Get together with your family as often as you can. Write a letter. Remember how much fun it is to receive personal snail mail? And, more than anything, remember to say “I love you”. Little did I know that the last time I said that to Keith (at the end of a phone call like we always did), it would be The Last Time. *It is so hard to skip Keith.